Examples of these statements can be seen in National Geographic, Science News, the New York Times, etc. These popular reports leave out some very important caveats. The NCA4 results are from computer climate model runs, some of them implausible. The climate models used to compute the effects of human influence on climate have never successfully predicted the weather, weather cycles (such as El Niño or La Niña events), or climate. All climate models fail to predict the weather or climate, with the possible exception of the Russian model INM-CM4 (Volodin, Dianskii and Gusev 2010). This model is mostly ignored by the climate community, presumably because it does not predict anything bad. As you can see in Figure 1, INM-CM4 matches observations reasonably well and that makes it an outlier among the 32 model output datasets plotted. This success also makes INM-CM4 the only validated model in the group. Figure 1. A comparison of 32 climate models and observations. The observations are from weather balloon and satellite data. The two observational methods are independent of one another and support each other. The plot is after Dr. John Christy of the University of Alabama in Huntsville (Christy 2016). A computer model is developed for a specific purpose and its validity must be determined with respect to that purpose (Sargent 2011). Climate models have been developed to predict future climate, with an emphasis on predicting global average temperatures, due to concerns that human fossil fuel use will result in dangerously higher global average temperatures. A secondary purpose of the models is to determine how much warming is due to humans and how much is due to natural variation. This is a tall order, since the warming over the past 120 years is less than one degree Celsius, a very small number relative to annual or daily temperature variations. To validate any model, we must specify the required accuracy of the model output to meet our needs (Sargent 2011). The total temperature change over the past 120 years is about one degree and we want to know how much of that is due to nature and how much is due to humans. To meet this objective, the model must be accurate to better than 0.5 degree per century. Figure 1 suggests that most models do not meet the minimum threshold of 0.5 degrees/century for the period 1979 to 2015. On average (the red line) the models are 0.5 degrees above the observations by 2015, only 36 years after they were initialized in 1979. INM-CN4 is labeled and it, alone, is tracking the observations with enough accuracy, yet it does not predict dangerous temperatures in the future or any significant human influence on climate. The spread of model results, in 2015, after 36 years, is 0.9 degrees C., which is comparable to the entire change in temperature for the past 120 years. Thus, the spread in model results, argues that the accuracy is inadequate for the stated purpose of the models. Both volumes of NCA4 argue that humans are mostly responsible for the recent observed global warming, that the recent warming is causing climate change, and that the climate change is dangerous. Figure 2 illustrates this chain of logic, the shades of gray indicate the uncertainty in each step, very low uncertainty is black, light gray is very uncertain. Figure 2. The NCA4 chain of logic, deep black indicates very low uncertainty, very light gray indicates high uncertainty. We can be very certain that climate is changing, we can observe the changes and see it in history and the archaeological record. It is well documented, to read more about the record see my posts on climate and civilization here and here. Humans are currently burning large quantities of fossil fuels and causing the concentration of CO2 to increase in the atmosphere, it has increased by 27% (from 0.032% to 0.04%) since 1959 according to data collected at the Mauna Loa observatory in Hawaii. CO2 is a greenhouse gas and increasing its concentration in the atmosphere will slow the loss of thermal energy from the Earth’s surface and, thus, cause some warming in the lower atmosphere. So far, we are in the deep black, very certain boxes. Surface temperature models were used to compute the 0.65 degree C central estimate, yet as we can see in Figure 1, the range of model results is larger than this in the mid-troposphere, just for the period from 1979 to 2015. This fact alone invalidates their conclusion. We will not discuss the problems with the NCA4 determination of the human impact on climate here, this has been well covered in other posts, by myself, Judith Curry and others. We will just point out that the models and process they used are the same as those used by the IPCC in their fifth assessment (IPCC 2013). NCA4 volume one provides the climate change projections for the future and volume two discusses the current and projected impacts on society due to these projections. It also discusses how we might mitigate and adapt to the changes. Because they have already concluded (by accepting dubious climate model output as fact without enough evidence, in our opinion) that human fossil fuel use is the cause of 93%-123% of recent climate changes, their discussion of mitigation revolves around eliminating fossil fuel use. However, the calculation of the impact of human fossil fuel use is swamped by the uncertainty in their models and unvalidated. Since volume two is entirely based on the human impact calculations in volume one, it is almost entirely invalid. Climate change is real, climate has changed throughout the Earth’s history and will change in the future. Many times in human history climate has changed more rapidly than it is changing today, these changes are documented here and here. Probably the best example is from the end of the last glacial period, 11,700 years ago, after the Younger Dyas cold period, when temperatures rose 5-10°C in just a few decades in the Northern Hemisphere (Severinghaus, et al. 1998). This is an astounding 9°F to 18°F in much less than 100 years. Humans adapted and even thrived during this change, which occurred at the dawn of human civilization. Despite this evidence, NCA4 insists that recent warming is unprecedented, this is a clear error in the report. Due to the considerable doubt about the magnitude of the human contribution to climate change it would seem foolish to destroy the fossil fuel industry, throwing millions out of work and crushing the world’s economy with higher energy prices. Anything this foolish and destructive should certainly wait until (and if) the climate models used to create the projections used in NCA4 volume two are validated and produce a much tighter set of projections than seen in Figure 1. However, the chapter on adaptation is still valid. If some climate changes are harmful in some areas, these ideas are useful. Regardless of how much climate change is man-made, communities should adapt by improving their infrastructure to resist climate-related threats. Coastal areas should improve storm-surge and flood barriers, the western U.S. should improve their forest management to make fighting forest fires easier, every part of the U.S. should improve their surface water drainage, etc. Adaptation is an obvious thing to do, the benefits of mitigation (reducing fossil fuel use) are far more speculative and much less likely to be effective (May 2018). Bjorn Lomborg has also written extensively about this in his book Cool It and in articles such as this one. NCA4 reports that construction of adaptation infrastructure in the U.S. has increased since 2014, which is a good thing (page 53, Report-in-Brief). I may have missed it, these reports are very long, and I didn’t read every word, but I don’t think the benefits of global warming and increasing CO2 levels are discussed or considered, outside of a few vague throw-away comments without documentation. There is a throw-away comment on page 37 of the Report-in-Brief: “Some aspects of our economy may see slight improvements …” but no discussion of the benefits. This is a major oversight, since the only impacts of climate change that can be verified to date, are beneficial. The additional CO2 in the atmosphere acts as a strong plant fertilizer and it also makes plants more resistant to drought. This has helped increase farm and forest productivity in the U.S. and around the world (Zhu, et al. 2016). Zhu et al. show that CO2 fertilization effects explain 70% the greening of the Earth since 1982. This is discussed in more detail here. As the planet has warmed the past 120 years new land has also opened for agriculture in the far north of Canada and Asia, which has also increased agricultural productivity in those countries. Kip Hansen has discussed global greening here in a very good post with abundant references. NASA also has a page devoted to CO2 greening of the planet here. Yet, while the report acknowledges that U.S. forested area has increased (see Chapter 6) they neglect to say it was mostly because of additional CO2. While they mention that forests and wildlife are expanding to higher elevations and northward due to warming, they do not acknowledge that a large part of this expansion is due to additional CO2 and global warming. Then they inevitably ignore that this is a good thing and characterize the expansion and greening as “aiding the spread of invasive species” (Report-in-Brief, page 44). Every effect of warming or increasing CO2 is presented only in a negative light, showing a complete lack of lack of scientific reasoning or methods and displaying blatant political advocacy. The report mentions that if the world warms, there will be more deaths due to extreme heat, which is true. Then, they project that the reduction in cold-related deaths due to warming will be smaller and the number of temperature related deaths will increase, not decrease as most previous studies have concluded (their study is here). In fact, in all parts of the Northern Hemisphere mid-latitudes, most deaths occur in the winter and the optimum temperature (meaning the time of fewest deaths) is near the average local summer temperature. Thus, humans are very adaptable and when they adapt, they adapt best to the local summer temperature. The statistical method used does not appear to consider adaptation, and the result is contrary to previous studies, which conclude that warming will decrease net deaths. They write the opposite in their report and state (without enough documentation in my opinion) that “the increase in heat deaths due to climate change will likely be larger than the decrease in cold deaths.” This is a difficult area to study and fraught with uncertainty, but it seems likely that they are wrong, and the net effect will be fewer deaths due to weather (Dixon, et al. 2005), not more. Besides the excellent paper by Dixon, I’ve written on climate-related mortality here. It is revealing that this group would do a risk assessment of man-made climate change and not consider all sides of this argument. It hurts their credibility. So, we see that disaster losses have increased recently, but attributing these losses to climate change (man-made or otherwise) is not possible at this time. Pielke Jr. in testimony to the House of Representatives Committee on Science, Space and Technology (Pielke Jr. 2017) has shown that disaster losses, as a percent of global GDP, have gone down since 1990. There is no trend in the frequency of storms, droughts, or floods over the last 100 years. 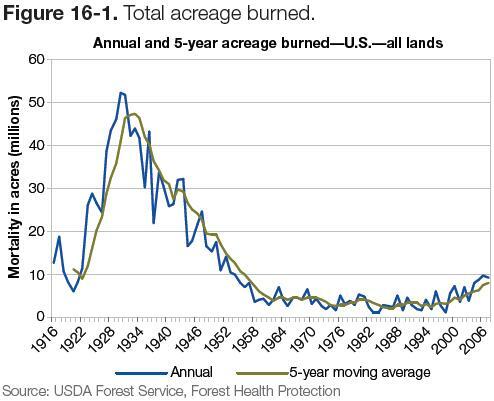 We actually have fewer acres of land burned today than we did in the 1930s. NCA4 volume two assumes that human CO2 emissions dominate climate and that we can change our climate future by reducing our fossil fuel emissions. But we have already seen that the uncertainty in this conclusion is much larger than the changes we have observed. They falsely equate “climate change” and “man-made climate change.” By doing this, they can take any negative effects of climate change and blame us for it. Precisely so, the whole document does read like a Hollywood movie script. At any moment we expect Dwayne Johnson, Ben Affleck and Bruce Willis to jump out of the pages to save the world from Armageddon. A serious scientific report would cover the whole subject, good and bad. This reads like it was written first and then references selected to fit the narrative. I have some respect for the most recent IPCC reports (IPCC 2013) and (IPCC 2014b) and refer to them often, but they cover both sides (at least in the actual report, the summaries often don’t). I’m afraid the NCA4 does not and as a result, it is a national embarrassment. Charney, J., A. Arakawa, D. Baker, B. Bolin, R. Dickinson, R. Goody, C. Leith, H. Stommel, and C. Wunsch. 1979. Carbon Dioxide and Climate: A Scientific Assessment. National Research Council, Washington DC: National Academy of Sciences. http://www.ecd.bnl.gov/steve/charney_report1979.pdf. Christy, John. 2016. Testimony of John R. Christy. Washington, D.C.: U.S. House Committee on Science, Space and Technology, 23. https://docs.house.gov/meetings/SY/SY00/20160202/104399/HHRG-114-SY00-Wstate-ChristyJ-20160202.pdf. Curry, J. 2017. Climate Models for the layman. GWPF Reports. https://www.thegwpf.org/content/uploads/2017/02/Curry-2017.pdf. Dixon, P., D. Brommer, B. Hedquist, A. Kalkstein, G. Goodrich, J. Wlter, C. Dickerson, S. Penney, and R. Cerveny. 2005. “HEAT MORTALITY VERSUS COLD MORTALITY A Study of Conflicting Databases in the United States.” AMERICAN METEOROLOGICAL SOCIETY 937-943. https://journals.ametsoc.org/doi/pdf/10.1175/BAMS-86-7-937. IPCC. 2014b. “Climate Change 2014: Impacts, Adaptation, and Vulnerability. Part A: Global and Sectoral Aspects. Contribution of Working Group II to the Fifth Assessment Report of the Intergovernmental Panel on Climate Change.” In Climate Change 2014, by C.B. Field, V.R. Barros, D.J. Dokken, K.J. Mach, M.D. Mastrandrea, T.E. Bilir, M. Chatterjee, et al. Cambridge University Press. www.ipcc.ch/pdf/assessment-report/ar5/wg2/WGIIAR5-PartA_FINAL.pdf. Lomborg, Bjorn. 2007. Cool It. Vintage Books. http://www.lomborg.com/cool-it. May, Andy. 2018. Climate Catastrophe! Science or Science Fiction? American Freedom Publications LLC. https://www.amazon.com/CLIMATE-CATASTROPHE-Science-Fiction-ebook/dp/B07CPHCBV1/ref=sr_1_1?ie=UTF8&qid=1535627846&sr=8-1&keywords=climate+catastrophe+science+or+science+fiction. Mohleji, Shalini, and Roger Pielke. 2014. “Reconciliation of Trends in Global and Regional Economic Losses from Weather Events: 1980–2008.” ASCE National Hazards Review 15 (4). https://ascelibrary.org/doi/abs/10.1061/(ASCE)NH.1527-6996.0000141. Pielke Jr., Roger. 2017. “STATEMENT OF DR. ROGER PIELKE, JR. to the COMMITTEE ON SCIENCE, SPACE, AND TECHNOLOGY of the UNITED STATES HOUSE OF REPRESENTATIVES.” U.S. House of Representatives, Washington, DC. https://science.house.gov/sites/republicans.science.house.gov/files/documents/HHRG-115-SY-WState-RPielke-20170329.pdf. Reidmiller, D.R., C.W. Avery, D.R. Easterling, K.E. Kunkel, K.L.M. Lewis, T.K. Maycock, and B.C. Stewart. 2018. “mpacts, Risks, and Adaptation in the United States: Fourth National Climate Assessment, Volume II.” USGCRP, Washington D.C. doi:10.7930/NCA4.2018. Sargent, Robert. 2011. “VERIFICATION AND VALIDATION OF SIMULATION MODELS.” Proceedings of the 2011 Winter Simulation Conference. https://www.informs-sim.org/wsc11papers/016.pdf. Severinghaus, Jeffrey P., Todd Sowers, Edward J. Brook, Richard B. Alley, and Michael L. Bender. 1998. “Timing of abrupt climate change at the end of the Younger Dryas interval from thermally fractionated gases in polar ice.” Nature, January 8: 141-146. http://shadow.eas.gatech.edu/~jean/paleo/Severinghaus_1998.pdf. Volodin, E. M., N. A. Dianskii, and A.V. Gusev. 2010. “Simulating present-day climate with the INMCM4.0 coupled model of the atmospheric and oceanic general circulations.” Atmospheric and Oceanic Physics 46 (4): 414-431. https://link.springer.com/article/10.1134%2FS000143381004002X. Wuebbles, D.J., D.W. Fahey, K.A. Hibbard, D.J. Dokken, B.C. Stewart, and T.K. Maycock. 2017. Climate Science Special Report: Fourth National Climate Assessment, Volume I. Washington, D.C.: USGCRP, 470. doi: 10.7930/J0J964J6. Zhu, Zaichun, Shilong Piao, Ranga B. Myneni, Mengtian Huang, Zhenzhong Zeng, Josep G. Canadell, Philippe Ciais, et al. 2016. “Greening of the Earth and its drivers.” Nature Climate Change 6: 791-795. https://www.nature.com/articles/nclimate3004. ← We can eliminate fossil fuels, no problem!